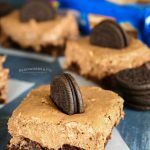 No-Bake Dark Chocolate OREO Brownie Bottom Cheesecake is an easy dessert recipe for the extreme chocolate lover. Perfect for parties or family celebrations. Do you love easy no-bake goodies? I sure do, especially when they include OREO Cookies and chocolate. 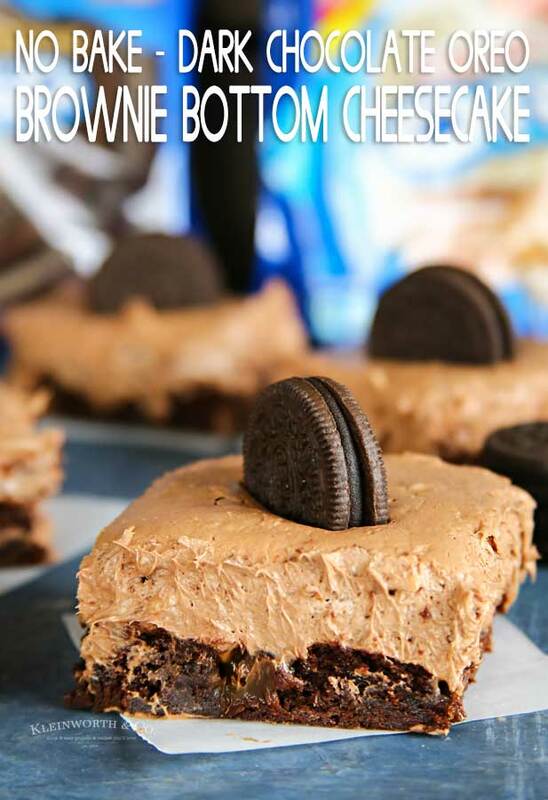 Check out this No-Bake Dark Chocolate OREO Brownie Bottom Cheesecake. We had a special birthday celebration in our family and I wanted to do something really special for the larger group of people we were celebrating with. Slicing a traditional birthday cake can get difficult for a crowd. So making a little goodie to share was a much better option. I headed to Walmart to pick up my supplies. While I was there I found these new OREO flavors that I couldn’t pass up. OREO Dark Chocolate & OREO Carrot Cake – hello delicious! I’m sure you can imagine my excitement seeing those. Where can I find these new OREO flavors? You can find OREO Dark Chocolate & OREO Carrot Cake flavors at Walmart. 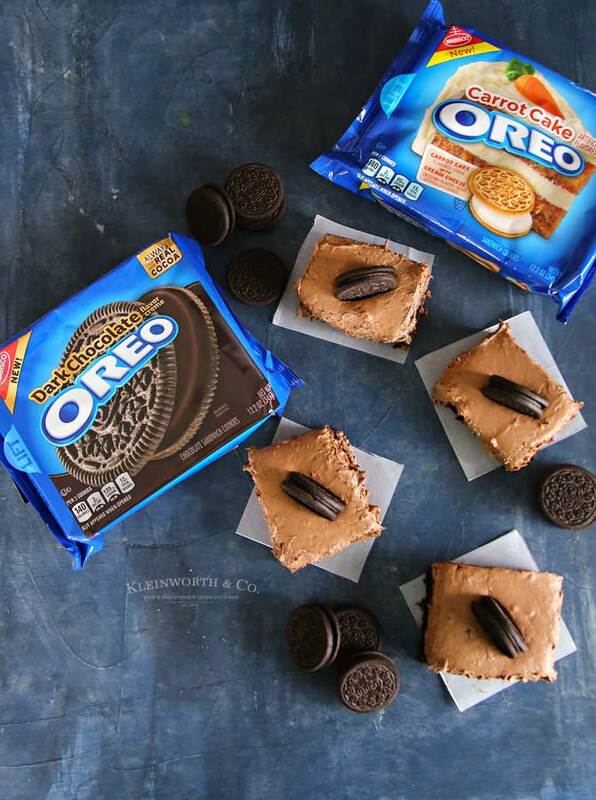 Be sure to visit select Walmart locations from February 14th through February 17th for exciting events celebrating the launch of the new OREO flavors, OREO Dark Chocolate & OREO Carrot Cake . I’ll be there for sure. **The events will feature an in-store sampling of the OREO Dark Chocolate Cookies & OREO Carrot Cake Cookies, fun games, giveaways, & free swag items! 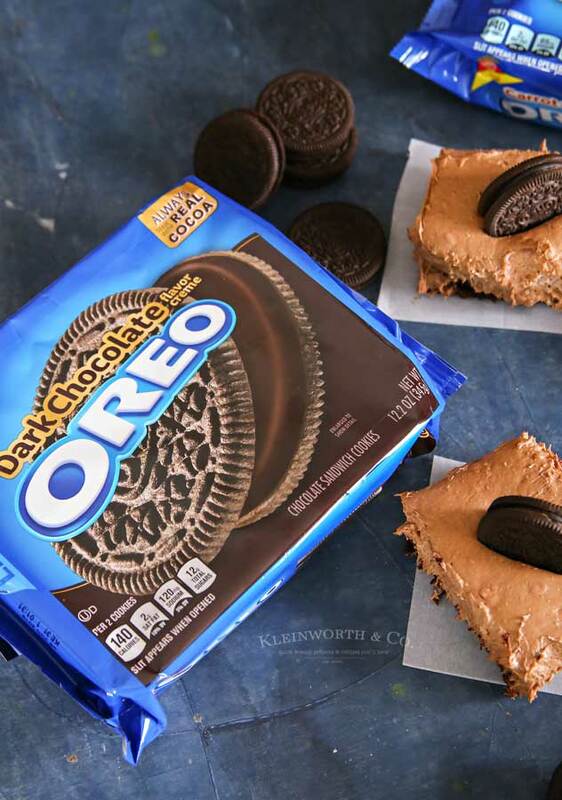 **To find a store near you, visit OREOStuf.com. This recipe says no-bake, but what about the brownie crust? It is true, you would have to bake a brownie crust if you wanted to start from scratch. But because this recipe is meant to be quick and easy, I like to pick up a small batch of already baked brownies from the bakery while grabbing my other ingredients at the store. That makes this recipe so simple. If you want to use what you have on hand, just bake a batch of boxed brownie mix to the package directions. Then make sure they are completely cooled before adding your cheesecake layer. Tell me about the new OREO Dark Chocolate Cookies on this cheesecake. 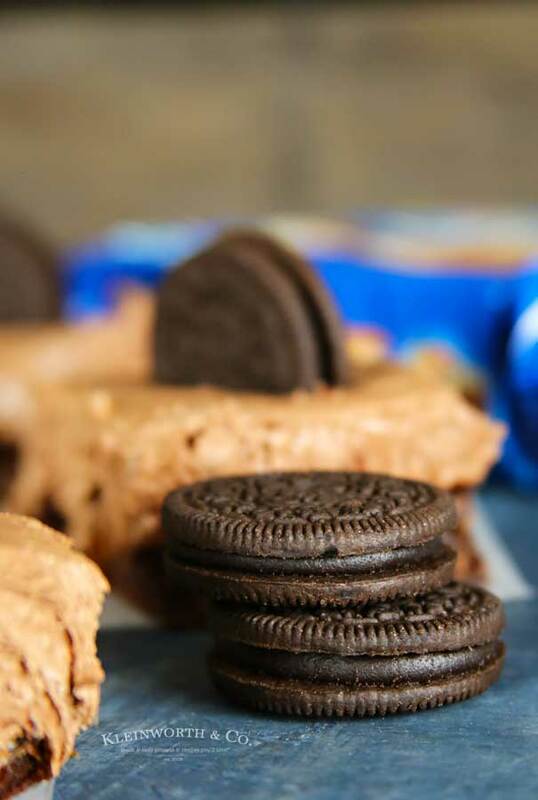 These OREO Dark Chocolate Cookies feature a dark chocolate-flavored creme that is sandwiched between two classic OREO chocolate wafers that you already know & love. They are absolutely scrumptious for the dark chocolate lover. How about the OREO Carrot Cake Cookies? The OREO Carrot Cake Cookies feature a cream cheese frosting flavored creme. Doesn’t that sound incredible? More on those to come soon, so stay tuned. 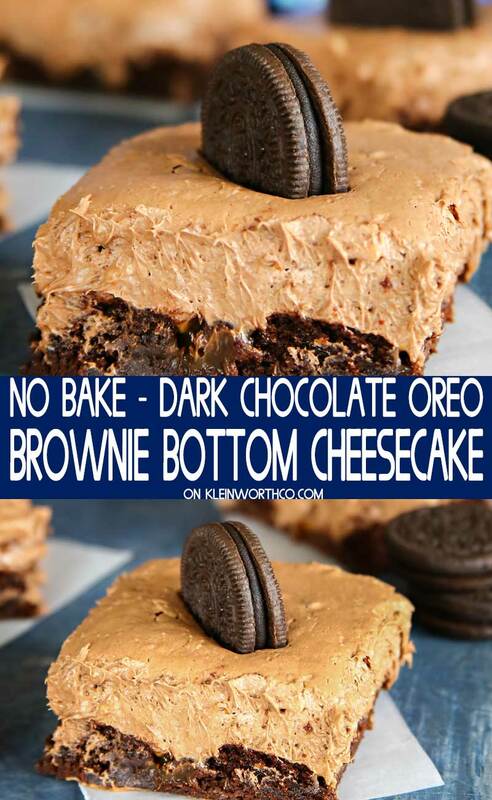 HOW DO YOU MAKE No-Bake Dark Chocolate OREO Brownie Bottom Cheesecake? In a large bowl, beat the whipping cream & 1/4 cup of the confectioners sugar together until stiff peaks form. 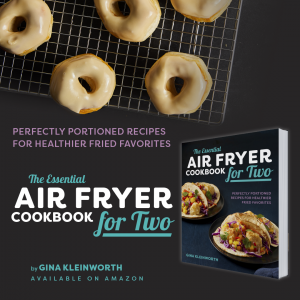 In another bowl, combine cream cheese & remaining confectioners sugar and beat until soft. Whisk in sour cream, melted chocolate & vanilla extract. Fold the whipped cream mixture into the cream cheese mixture until evenly combined. Spread the cheesecake mixture over the top of your brownies. Refrigerate at least 4 hours before cutting. 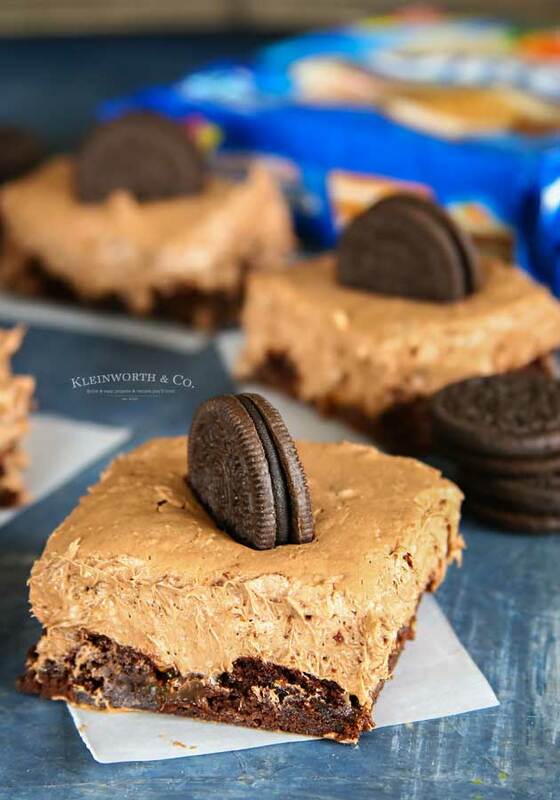 When ready to serve, cut the cheesecake into squares and top with one OREO Dark Chocolate Cookie on each square. Be sure to head to Walmart to pick up these new OREO flavors & make something delicious. In a large bowl, beat the whipping cream & 1/4 cup of the confectioner's sugar together until stiff peaks form.